Mazda is giving its Motability programme a boost this autumn with the introduction of a series of special deals on selected Mazda3 and Mazda MX-5 models for the remainder of 2011 and the continued availability of the Mazda2 automatic model with no advance payment. Motability drivers can now choose the compact Mazda3 1.6 TS hatchback, with manual or automatic transmission, for an advanced payment of just £499. The Mazda3 is the Japanese brand's best-seller worldwide and the automatic features a 4-speed gearbox with fully automatic and manual modes for maximum driving enjoyment. This 105ps model returns 37.2mpg on the combined fuel cycle and has CO2 emissions of 176g/km. Alloy wheels, dual-zone climate control air-conditioning, electric front and rear windows and a leather steering wheel with integrated audio controls are standard. The world's best-selling roadster, the iconic Mazda MX-5 sportscar is also now available for an advanced payment of £499 for the 1.8i SE model and £849 for the 1.8i SE Air Con. Both these soft-top convertibles promise truly rewarding all-year round sporty motoring backed up by Mazda's famed reliability. Steve Jelliss, Mazda Fleet and Remarketing Director responsible for the Motability programme, commented: "There are more than 700 Mazda3 models on Motability contracts which are due for renewal in the final quarter of 2011 and our autumn deals will provide our customers with another compelling reason to stay with the Mazda brand, whilst our dealers can also offer a much stronger proposition to other Motability drivers, in particular on the Mazda3 1.6 TS Automatic. "Meanwhile, the Mazda MX-5 remains an iconic car in the minds of most British motorists and has always proved popular when offered on the Motability programme. We have therefore re-introduced the roadster to the autumn programme in response to customer demand," added Jelliss. 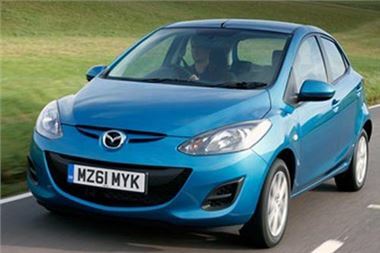 This year the stylish Mazda2 small car has been at the heart of the brand's Motability programme, with the five-door, automatic model proving especially popular. This TS2 model features a powerful 1.5-litre 102ps engine and a four-speed automatic transmission. Acceleration to 62mph is a brisk 11.9 seconds, while the CO2 rating is a modest 146g/km. Standard equipment includes alloy wheels and air-conditioning.